Issue 14/2015. This week’s publications of the week are about a novel phenotype consisting of persistent encephalopathies with MRI findings associated with SCN1A and SCN2A mutations, a novel gene for Malignant Migrating Partial Seizures of Infancy (MMPSI). Figure 1D and figure legend from the publication by Stödberg and collaborators, which was shared under a Creative Commons licence. 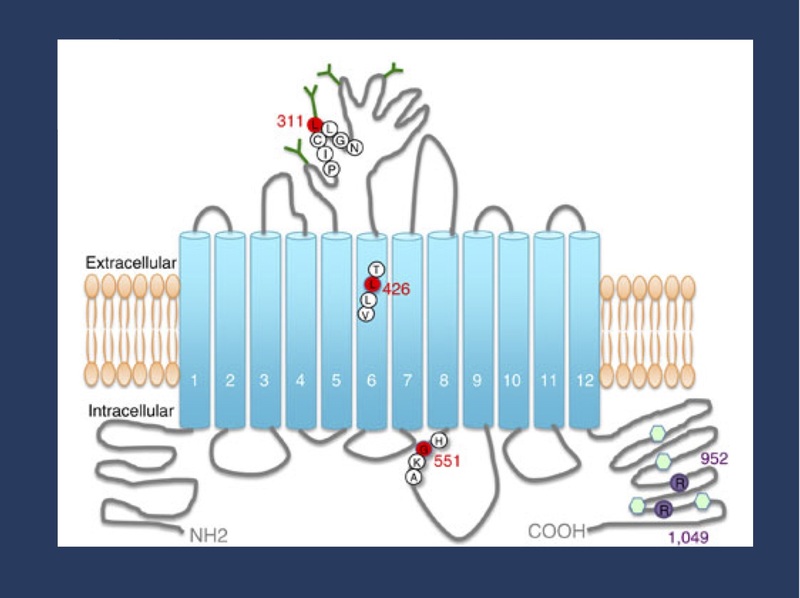 The KCC2 protein structure consists of 12 transmembrane (TM) helices (numbered blue cylinders) interconnected by a series of extracellular and intracellular loops. Sites of phosphorylation at the C-terminus are depicted as light green hexagons. N-linked glycosylated sites are indicated as dark green Y-shaped structures present at the extracellular loop between TM5 and TM6. The EIMFS mutations are indicated in red circles, located in the extracellular loop between TM5 and TM6 (L311H), within TM6 (L426P) and in the intracellular loop between TM8 and TM9 (G551D). Variants associated with idiopathic generalized epilepsy and febrile convulsions are represented as purple circles at the C-terminus. SCN1A in AESD. Even though most children with febrile seizures recover quickly after the seizures, some children may demonstrate persistent neurological findings. In some patients, there is even severe neurological impairment and findings on neuroimaging. Japanese neurologists have described an entity that they refer to as acute encephalopathy with biphasic seizures and late reduced diffusion (AESD). This entity has initially been described in Japan after an influenza outbreak and infectious causes are found in a significant proportion of patients. In a recent publication in Epilepsy Research, Saitoh and collaborators examine a cohort of 92 patients with AESD for mutations in SCN1A and SCN2A. They discovered 5 mutations in both genes, including two variants that were inherited. Other variants were found to be low frequency population variants in Eastern Asian populations. Comments IH: Causative or not? The publication by Saitoh and collaborators raises the interesting issue of how we should interpret inherited variants or low-frequency population variants in the setting of related, but not very typical phenotypes. Are these variants causative or contributory or simple random population variants? While I do not have an answer for this question at this point, this complex scenario underlines the importance of incorporating segregation data into our assessment of variants. Basically, for severe epilepsies, the de novo paradigm is the only disease model that is sufficiently established. SLC12A5 in MMPSI. The potassium-chloride co-transporter KCC2 encoded by the SLC12A5 gene is the protein that makes the effect of GABA inhibitory during development. Accordingly, impairment of this transporter may result in excessive excitation leading to epilepsy. In a recent publication in Nature Communications, Stodtberg and collaborators describe recessive mutations in SLC12A5 in Malignant Migrating Partial Seizures of Infancy (MMPSI) in two families. Comments IH: Families with dominant inheritance have been described earlier and the mechanism of KCC2 impairment leading to epilepsy is beginning to be understood. The current publication establishes KCC2/SCL12A5 as a novel gene for epileptic encephalopathies. This entry was posted in SCN1A, SCN2A, SLC12A5 and tagged SCN1A, SCN2A, SLC12A5. Bookmark the permalink.